The photo above and peanut butter are not exactly the same things. I got a wee bit carried away with peanut butter making. Most of us can find simply ground roasted peanuts in jars on our supermarket shelves. Some people in rural areas are having a tough time finding it. My idea was to teach everyone how to make their own peanut butter so they could avoid added sugars and oils. Turns out making your own peanut butter is AMAZINGLY simple. I bought 1 pound of unsalted roasted peanuts and using my chopping blade in my food processor for about five minutes had peanut butter. My only tip here is to wait until your food processor grinds it into the smoothest form it can. You will be surprised at how small it can get the peanut chunks - voila! peanut butter! Store it in a jar for a week and you never have to worry about peanut butter with additives again. But, I was bored (and a bit premenstrual) so I thought, “Hey, what would happen if I added cocoa powder to this?” There is a reason you get a coupon for Hershey’s kisses when you buy tampons. After about an hour of playing with it, I ended up with a treat. I was aiming for the perfect, healthy chocolate peanut butter but that bar is very high. What I found is that this stuff is seriously yummy. You can get some small jars and give this away as a holiday gift (but it must be kept refrigerated). It is a lot like the Peanut Butter and Co. “Dark Chocolate Dreams” or a peanut version of Nutella. Do you ever lose it and start adding chocolate to everything? Have you made your own peanut butter? Blend roasted peanuts in food processor until smooth. Add the rest of the ingredients and blend until smooth. Taste and adjust to make as yummy as possible. Love the idea of making your own pb!! And adding chocolate...fantastic!! I will definitely be trying this! o.m.g. .... I am in your debt forever! We love peanut butter. 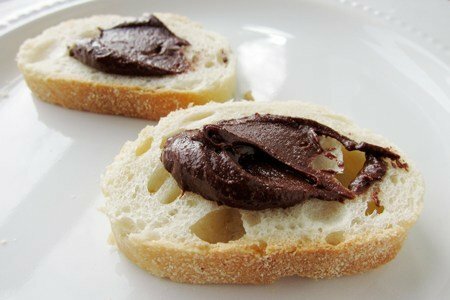 My kids also love Nutella but I'm not a huge fan of hazelnuts. This is perfect! Does this recipe for chocolate peanut butter only last one week being refigerated? BTW I love your make over recipes. I have two small grand children (5 & 3 years old) and they love PB&J and Nana is always baking or cooking something new. We can even make it together. I am also interested in how long it will keep in the fridge. My adult kids love this stuff as well. Can't wait to try this. I'm going to try it with almonds, as I love almond butter and with the recall Trader Joe's isn't selling their brand now. Elsewhere is too expensive. I don't really know how long it will last. It has been in my fridge for a week and is going strong. My guess is that it will last as long as peanut butter - why not? Question? What is it about this homemade peanut butter that requires it to be refrigerated? Should all natural peanut butters be stored in the refrigerator? Thanks! NOTHING, beats homemade peanut butter! I love it, love it, love it!! I heart PB & Co. Have you tried their white chocolate. So it's heart to find in stores and I don't want to buy a case to make shipping "worth it"! DIY is a great alternative! Thanks so much!!! I think I'd like to try this. Does refrigerating it make it hard to spread? Yes. I will make this!!! Curious how it would be using a different sweetener (honey, agave) as opposed to confectioner's sugar. I plan to make it with 2 or 3 Tbsp. honey as I don't want it too sweet. Will probably cut cocoa in half also. I order PB&Co as well but this looks yummy. Cannot wait to try it. I'll definitely have to try this! The only pb I've made is with the grinders in the store. That is my usual pb. And, as luck would have it, I used the last of my pb in my oatmeal this morning! I'm gonna have to go shopping for some peanuts! I have a question though. I never refrigerate the stuff I grind in the store, and I haven't had any problems with it. Should I be sticking it in the fridge? What should I be concerned about? Bacterial growth or it just going rancid fast? I haven't seen either. How do you figure out the nutritional information? I always have problems with this when cooking from scratch. Peanut butter is supposed to be much more expensive in 2013. Good idea to learn how to make your own now. I've tried almond butter before, but needed to add some type of oil (usually olive or coconut) to get it really smooth. Haven't made peanut butter b4. Anyone experienced need to add oil to homemade peanut butter? CC - I do plan to use almonds so I will let you know if I needed to add oil when I make it. Thanks for the heads up about adding the oil. I've been making my own nut butters lately. It's so much fun and they taste so much better! Did you really get a coupon for Hershey Kisses when you bought tampons?? Talk abou targeted marketing!